In this day and age, every credible business needs to have an online presence. That applies to professional bodyguards and security companies. 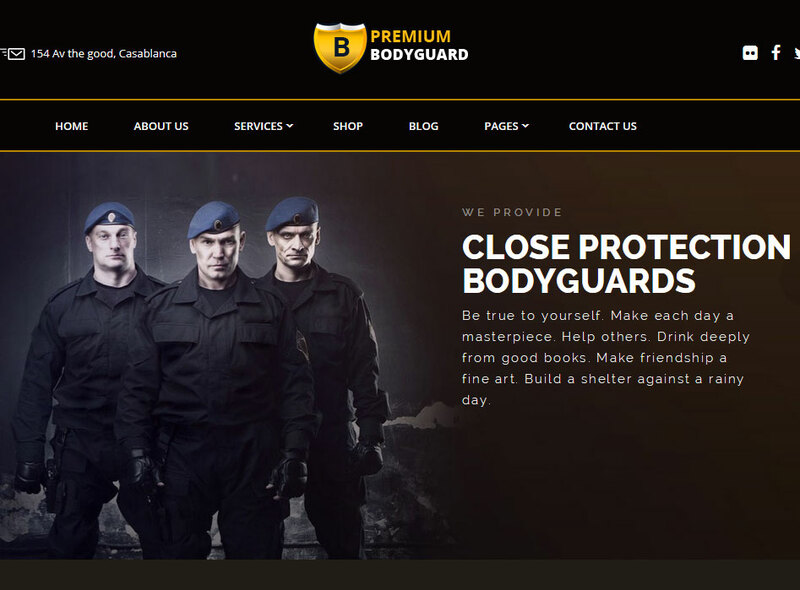 Bodyguard for WordPress is a premium theme for security companies. It has a retina-ready, responsive design. The theme is fully customizable and comes with Visual Composer and Slider Revolution. Bodyguard comes with scalable vector icons, so your website will look fine on old and new devices. You can change colors, layouts, and other options in the backend. Bodyguard is WooCommerce friendly just in case you have digital or physical products to sell. The theme has boxed and full-width layouts. It offers Google Maps integration. Bodyguard has a custom 404 page and offers unlimited portfolio layouts. It is built upon the Foundation framework. This is a commercial theme by an Elite Author.